Go pedal. Now. That’s the message. If you want to skip all of the rest of this, that’s fine. The moral of the story is at the beginning of this paragraph. If you want a bit of background as to one of the reasons why I follow that ethos, read on. This pic was taken today. It’s on one of my favorite loops that leaves from my doorstep. Leaving from my doorstep and taking a few hours to outrun some demons means a lot to me. Don’t get me wrong, sometimes I drive to get a good ride in. That’s cool, but I’d rather just ride and skip the drive part altogether. If I can pedal from and to the house I don’t waste any extra travel time. That leaves me more time to ride. I like love to ride. On today’s ride I revisited a loop I’d done once before. It’s 27.5mi or so long and includes 21 or so miles of pavement. The rest is comprised of No Winter Maintenance roads, and even less accessible roads than that. In those areas of the ride I find it difficult for F150 drivers who can’t read STOP on a sign to give me the run down. When they’re using an exit ramp, not so much. The steed of choice today was The Great Gonzo. Not all of my human powered vehicles (HPVs) have names. I don’t g out of my way to name inanimate objects, but sometimes there’s a reason to. The Hunter geared 36″ unicycle has a myriad of reasons. This uni belonged to a dear friend before it moved in with me. Dan used in in Ride the Lobster in 2008 when we were members of the Surly Speed Goats. He commissioned The Great Gonzo. After riding it for a while though, he determined that a geared unicycle isn’t his thing. For a long time I wasn’t sure it was my thing either. A geared hub complicates a unicycle on many levels. 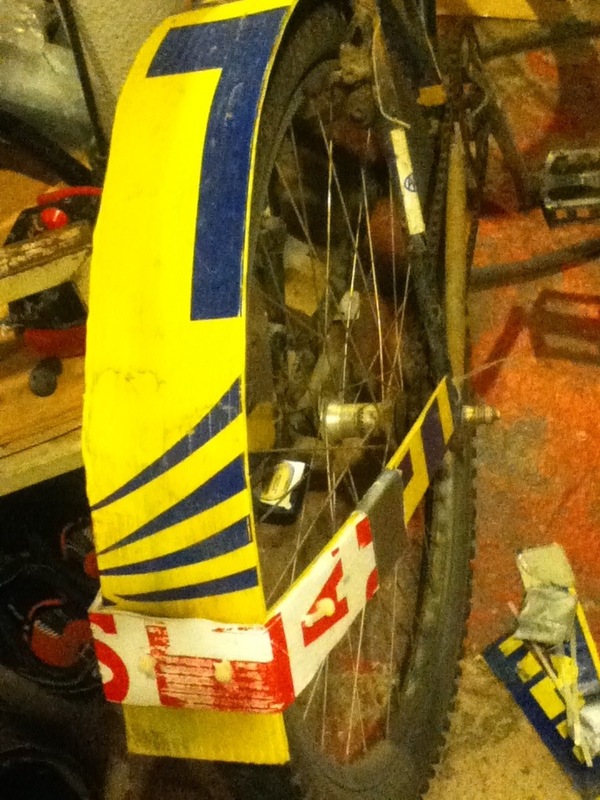 It often costs 2x or more the price of a high end unicycle for the hub itself. It adds complexity and a maintenance schedule. It makes riding a unicycle so much harder than without one. It also opens up whole new worlds. If you want to go really freaking fast on one wheel, this is the best gig going. That’s not entirely why I’m fond of The Great Gonzo though. I do like to go fast, BUT I realized a few years ago that I like to go a Med Express or FastER Care level of fast. For those not familiar with those places, they’re emergency care places that are a level shy of visiting the Emergency Room. They’re good for somewhere around the level of stitches. Broken bones are for the ER. I’ve had stitches several times. They caused me to miss some pool time, but rarely caused me to miss much riding. I’m not saying I’m a fan of getting them, but in the grand scheme of things, they’re tolerable. I am fond of The Great Gonzo (if you don’t know who this is yet, Google the Muppets) because the overdrive of 1.5:1 in second gear allows me to have a really, really, really versatile unicycle. Unicycles without gears are limited by their wheel size and crank length. A 36″ wheel may sound ginormous, but when it comes down to covering ground it’s about equivalent to putting a normal bike in the middle chainring up front and several cogs in from the biggest in back. Comfortable for smelling the roses, but not so good if you’re in a hurry. 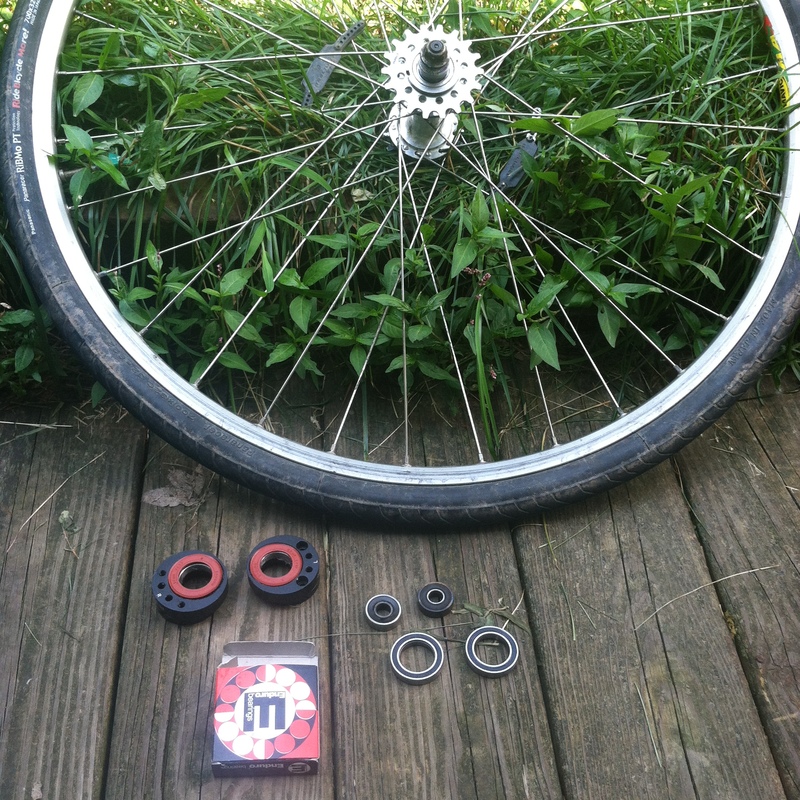 To compensate for a limited wheelsize, (ungeared) unis often use shorter cranks to make smaller circles. It’s a good plan, and it can help a rider achieve some good speeds, but the tradeoff is that hills are harder and the torque is less. Smaller circles with the legs are good for speed, but not so good for control in sketchy situations. The second gear overdrive of a geared hub changes things. I like 100mm cranks on my ungeared unicycle when I’m in a hurry. The downside rears its ugly head when I can’t climb the 15%+ grade 2 blocks from my house at the start of the ride and I have to take a detour of several blocks (or walk, but walking on a ride?- no thanks). I discovered with the geared unicycle I can run 150mm cranks and climb up the beast 2 blocks over, then shift into overdrive and cruise several mph faster than I can on the ungeared uni. I’ve really grown to like the 150s for that reason. I also like them because they do slow me down a bit. I know a fair number of go fast people who prefer shorter cranks (137mm typically) on their geared 36″uni so that they can, well, go fast, and spin smaller circles when they’re in the 1:1 mode the hub offers. I totally respect that thinking. For me though I prefer the slightly longer cranks because I get a first gear that allows me to get lost enough that F-150s can’t change the color of my chamois to brown. First gear allows me to climb almost any hill within reason and then keep the speed in check when I shift to a FastER Care level on the other side. Sure, I could go faster with shorter cranks in second gear. My Jedi skills just may not be there yet. Or I may just be a chicken. I did see a feral one on a gravel road through Moraine a few rides ago. That may be a story for another time. Or not. A new post. Yep, it’s been a while. I’ve got a back log of ideas for entries that need done, and this one won’t necessarily be as good as I hoped on some levels. On other levels, it’s about perfect. I’m not a person to say that USA is #1 in the world at the expense of everyone else. At the end of the day, we’re all citizens of earth. At the same time, I’m sometimes proud of what we do as a country. 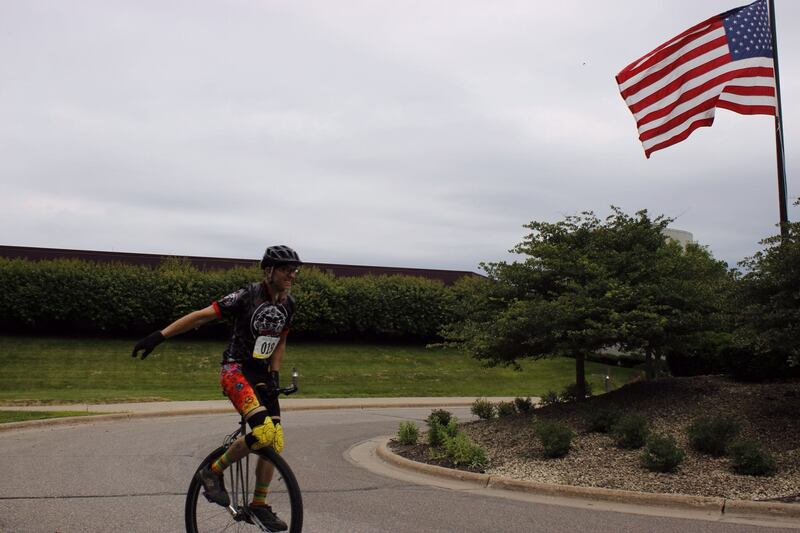 Thanks to Danielle Ross for snapping this pic on July 4th, 2014 at the North American Unicycling Championships and Convention in Eagan, MN. July 4th in the US means a lot. I hope we don’t get caught in the dangerous -isms that can blind us to our neighbors around the world who don’t share the freedoms we do. I also hope that we don’t use our freedom to oppress others. Again, lots of people need to SHARE the resources of this planet so all of us have a future. All that being said, I’m particularly proud of my racing kit in this picture. First impressions might be that my fashion sense has sustained quite the blow to the head, but I’d argue otherwise. My jersey and shorts aren’t the product of sweat shops. They’re made by Aero Tech Designs based here in Pittsburgh, PA. Not only is the company based here, but they have an excellent selection of affordable cycling apparel Made in the USA. I’ve met some of the employees when I toured the Coraopolis factory and offices. I’m impressed with the operation for sure. While not everything in their catalog is Made in the USA, a lot of it is. It’s not all made in Pittsburgh either. Reading descriptions and asking questions is (as always) a good plan. In the interest of full disclosure, I didn’t pay for the jersey. 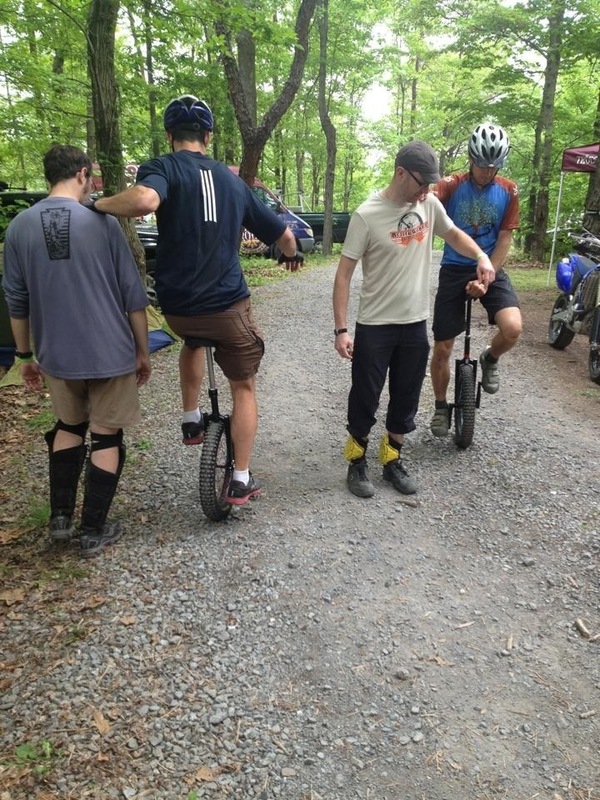 It was won for being the top unicyclist at the 6 Hours of Brady’s Run back in May. James and myself both completed 4 laps of the course on our unis. On that day I was a bit faster than him. On that day we both rode more than some of the solo bikes. I didn’t pay for this pair of shorts either. I got sponsored by Aero Tech Designs for the journey to NAUCC 2014 (The North American Unicycling Championships and Convention) and Unicon 17. That entails me testing a few pairs of shorts and spreading the word about what I think of them. If it’s any indication, I’ve already purchased 2 pairs for my wife. Full reviews of the products are to follow after some long term testing. For now I can say the jersey is as good or better than any other cycling jersey I’ve worn up to this point and the shorts are more than comfortable enough to wear for at least a full Marathon of unicycling. Yes, that means over 26 miles without stopping. How long does that take? It took me 1:44:53 on race day. I’ve been looking for affordably priced, domestically made, quality cycling clothing for some time. I’ve loved my Musa shorts and knickers for at least the past 6 years. However, there was a gap when it came to the intersection of padded shorts and my wardrobe for some time. I’m excited now that Aero Tech Designs has my backside covered. This is one of my favorite songs. It was highly appropriate today. As many people have realized, life in America is being crippled by a lack of reason. Common sense is no longer the norm. I’m definitely not a guru, but living without the earbuds in 24/7 and limiting the Matrix time allows the brain to connect a few dots. It’s easy to go on about unchecked governmental agencies and greed at the corporate level, but I’d rather not soapbox now as it’s just not the time. I need to wrap this up and get to pedaling. 1. Our new health care system currently in the implementation process may not be a solution to the problems at hand, but when the Director of Billing for a major medical conglomerate can’t figure out what is happening when their personal medical bills through another system arrive and need paid, there are some major problems with the current billing and insurance system. 2. If the current trends in education go unchecked, I predict a shortage of middle school Math, Science, and possibly English teachers in the next few years. Those who go into teaching do it for the children. That’s not where things are headed. It’s not the teachers’ nor local school’s fault. It goes much higher than that. 3. Fracking. Replace “ra” with the last full-time vowel in the alphabet. In spite of losing the bet to Orwell, all is not lost. I was pedaling down the street when a large blue pickup truck headed in the opposite direction turned left about 100ft in front of me- into the wrong way of a one way alley. He then proceeded to pull out and back up. Unfortunately for me, that was right into my path and nearly into me. I dodged (this time not a wrench or a ball), and rode by. He finished pulling out and we rolled the 1/2 block to the light. “That guy’s an @$$#%&*!” I looked over and he smiled at me as I rode by. I gave him the thumb’s up and thanked him for making my day. Sometimes the unicyclist in a rain suit isn’t the clown after all. Today’s lesson: Let it go, this too shall pass. Note: Yep, I’m behind again. I’ve got 2 posts that should have been done instead of this one, but sometimes things come up. Sometime between 10pm last night and 5am this morning we got slapped with another round of Guess the Groundhog was right. First, somewhere around 7″ of snow hit, then the cake was iced with a nice dose of freezing rain. Beautiful to look at, yet potentially treacherous to travel in. After digging us out and waiting a while for the Plow King to do his thing it came to the time of day when I needed to head across town for a doctor’s appointment. No biggie, grab Vlad and go. Vlad’s backside is featured in the pic at the top. He’s an ex-messenger bike with at least a dozen winters of saltiness under his belt. And yes, he is named after Vlad the Impaler. For me, grabbing the bicycle in adverse conditions is natural for reasons I’ll explain in just a minute. One member of the pickup driving public didn’t see my use of a bicycle as a reasonable transportation solution in less than ideal conditions. Fortunately for me, he was kind enough to verbally express his opinion too. The story first started when I was sitting in a left hand turn lane at a red light. When the light changed I turned left and accelerated onto Pillow St. Even though there was a stop sign about 2 blocks away I apparently wasn’t going fast enough (somewhere around 12mph). The first black pickup truck just passed silently and sprayed me with winter slush in the process. The second black pickup in line was also in a hurry- to a point. He rolled down his window as he rolled by (in the oncoming lane) and said something. I asked for 4 feet and then he slowed down. Honestly he was very friendly. Really. In a calm voice (while driving in the middle of the road) he said, “I get it. I fully support what you’re doing, BUT you shouldn’t be out here (on the road).” He then politely told me that the sidewalk would be safer as it’s out of the way. I said I’m OK and let him roll on. It was one of those interactions where I think he was genuinely concerned about my well being. There was no anger on either party’s part. I wish I had a chance to sit down with him and discuss why I was on my bike on the road in the middle of winter. I think we could have had an interesting conversation. 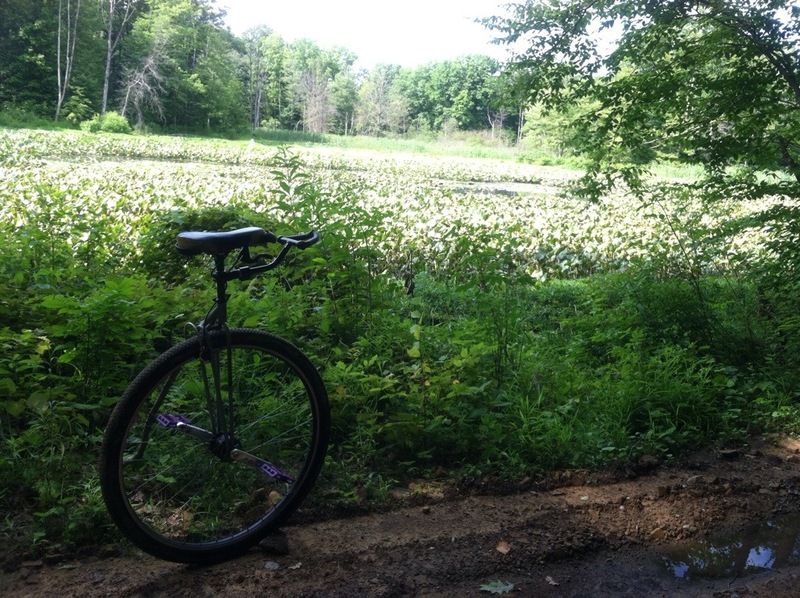 Since that’s not likely to happen, I’m going to share with those who happen to stumble across this post why I choose to pedal in less than ideal conditions. Some of my reasoning is specific to my circumstances. I’m not going to say everyone, everywhere should be pedaling through the snow. 1. Physics is on my side. Sure, if some lead foot gets it in their head to steamroll me, I’m going to lose. For the route I was taking today it would require someone diligently seeking to run me down. I was riding in the city. There was never a section of my trip that had more than 3 blocks between traffic control devices. I live on a brick hill. When I left this morning and started down the hill, there was a car midway down that was turning around after failing to climb the hill. I cautiously rode the brakes down the hill keeping my sub 200 lbs of total mass well under control. I can’t say I’ve seen automobiles always pull that off on our street. On more than one occasion, there have been tracks to the curb. Once a car left a good part of its exterior all over the road as it ping-ponged from immovable object to immovable object for about 3 blocks. I’ll take my chances without an extra 2 tons dragging me down. I always know that if things get too sketchy, every bike comes with a hiker. This pans out for the uphills too. I can easily push my bike home without leaving it on the roadside. 2. It’s faster. I didn’t have to shovel out the car, scrape it off (remember the ice), and heat it up. As a matter of fact, the trip across town was just as fast by bike today as well. The car that was turning around as I headed down the hill followed me for a bit. About 12 blocks later we arrived at the same intersection after taking different routes. We both followed the traffic laws. I could easily take alleyways and less than perfect roads where he was better off sticking to the main plowed roads. It should be noted too, I wasn’t racing. I was just riding along at a comfortable in the slush pace. 3. It’s safer than walking. This point is a bit of a rehash of #1 mixed in with possibly a bit of arrogance about my bike-handling skills, but I will ALWAYS take the road over the sidewalk. I cycle to work 5 days a week and I walk the dog in the morning those same days. I typically fall walking at least 3x as many times as I’ve laid the cycle down. To me it’s simple: roads are well maintained; sidewalks? sometimes. It’s a property owner’s responsibility to take care of the walkway, and some of them aren’t. I ride in the winter because it makes sense- for me. I not looking to be a badassican. I’m looking to get safely where I need to go. And now I need to stop typing and head out again- by bike. I’ve got the vanilla ice cream that needs delivered. First, a disclaimer: opinions expressed here are just that. The blog tends to get used often for personal reasons. It’s a place to document a particular place in time. Some people keep a journal, I choose here. This has 2 benefits: 1. This beats grabbing scraps of paper and jotting down ideas only to lose them. Blogging works well as long as I remember the login password. And, 2. It’s possible there’s something presented here that needs discussed further. That’s good for me as I try to keep an open mind (even if most of the time as of late it’s covered by a wool hat). Yesterday’s post about the dislike of parades generated more responses than I’d anticipated. Several people brought up great pro-parade points. Thanks Mike and Mike (and everyone else who commented too, but Mike and Mike is the most fun to say). I still personally don’t care for parades. For me, they’re mostly a poor investment of time. However, I do see they have value for many unicyclists. The best way to get a person to try unicycling is to get them on a unicycle. It’s not just exposing them to the concept that counts, it’s putting them on the actual saddle. Sure, parades are a good way for people to see other people riding unicycles in person. If we move to just observing unicycling in person and extend observing to cyberspace, the internet has a lot of unicycling going on (relatively speaking- the lol cats definitely have the upper hand in popularity). The step from observing something to doing something is often pretty big though. There are people who make the jump from observer to participant because they just saw someone do it. They’ll seek out an opportunity to try something new and take the risk. The step becomes a lot easier, however, if the opportunity to try is now rather than later. Handing out flyers is typically an ineffective way of getting a message across. We’ve done it at parades. We’ve done it at other events. There’s a lot of work for little return. At parades especially there’s little opportunity for interaction between those riding and those watching. There isn’t much time to ask or answer questions regarding unicycling. A table at a festival or event lends itself to a little more discussion time. Being able to get the potential unicyclist on a unicycle right now changes things significantly. We all learn better from our own experience than by someone else’s. Telling and showing will never replace doing. I learned a few years ago to prioritize community service based upon potential impact. I shoot for being effective without an inordinate amount of effort. 1. People want to interact with other people in meatspace. If you can spend time face to face and be honest about why you like unicycling and then give them the opportunity to try it, there’s a good chance they will. 2. Nothing attracts a crowd like a crowd- especially when attempting a new skill. When we’ve got one learner, that person typically progresses at a slower rate than when we have several people at a similar stage. They bond with each other. They talk and share the experience. This extends to single serving experience people as well- those people who will try for 5 minutes and then never again. If there are multiple unicycles available that they can sit on while their friends are too, they are more likely to try. 3. People like to beat records. Whether it’s riding unassisted for 5 pedal strokes learning to turn, or hopping onto a picnic table, success achieved with effort is incredibly valuable. 4. In moving people from “Unicycles exist” to “I think I’ll try it” we’ve found the greatest returns on our efforts in partnering with organizations that allow us to set up a space and let people try it right there, right now. Sure, many people give it a go for the novelty of it never to return to it. But, universally they get an appreciation for the sport from the experience. Instagram and facebook often end up with a few more pics of people on unicycles too- hopefully putting us a step closer to catching the lol cats in the cyber ranks. One closing thought: in trying to get people to try unicycling, it’s important to not insist they give up bicycling.